Today we are gathered to mark the launch of the Chinese Embassy's social media platforms. In the age of the Internet, the power and influence of new media is increasing. And such power and influence cannot be understated. In China, social media subscribers are growing at an exponential rate. The result is unprecedented activity in this new form of communication. As I speak, 597 million people in China have subscribed to social media. That is 91% of total net users. This is a much higher proportion than in western industrialised countries. In China's diplomacy, we have been keeping abreast with the surging waves of new media. Social media is becoming a new platform for China's public diplomacy. 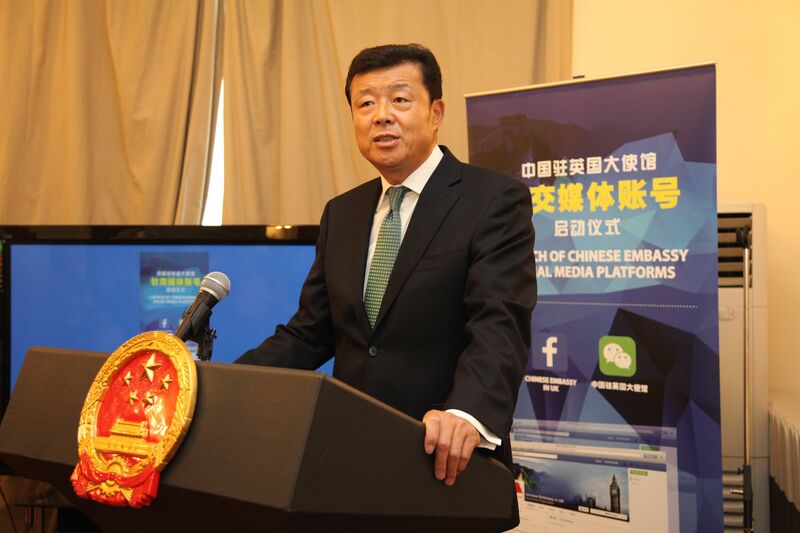 The Ministry of Foreign Affairs and Chinese missions all over the world have opened social media accounts, making considerable use of new media. 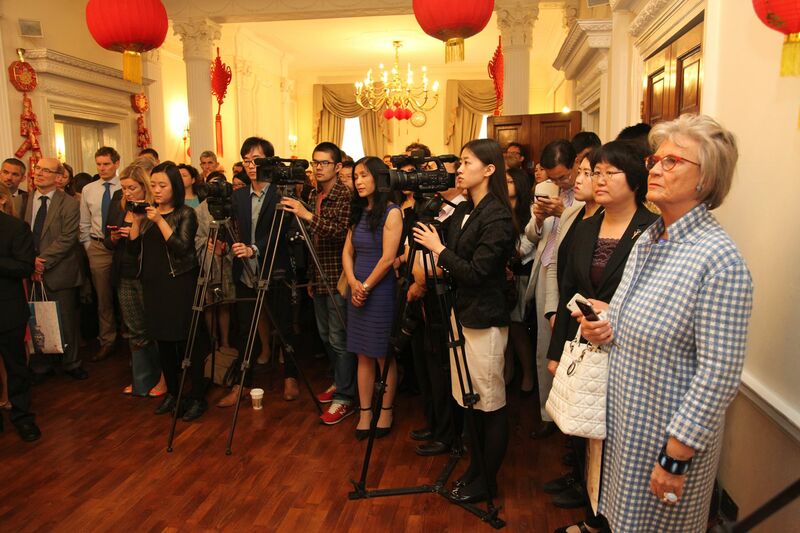 Today, we are launching WeChat and Facebook pages of the Chinese Embassy in London. This will complete the website-based media platforms of the Embassy with increased outreach. First of all, they will reach out to the public with latest and authoritative information about China-UK relations. These social media platforms will be the best source of news, events, facts and figures for all. In October, Chinese President Xi Jinping will pay a state visit to the UK at the invitation of Her Majesty The Queen. This will be the most important agenda of the year for China-UK relations. It will mark a new milestone in this relationship. President Xi's visit will put the future development of China-UK relations on a solid foundation, and will herald the beginning of a "golden time" for this relationship. This year will also witness a series of positive events. Cooperation between China and the UK will be full of highlights. Take for example the China season of the 2015 China-UK Year of Cultural Exchange. It will soon be launched in the UK. This programme will definitely boost cultural exchanges between our two countries, leading to unlimited cooperation. I hope you will follow us on WeChat and Facebook and support China-UK relations. Second, these social media platforms will help draw a much larger circle of friends into building the China-UK relationship. As China-UK relations continue to grow rapidly, the bonds between the people of our two countries have become ever closer. The circle of friends is rapidly expanding. Above all, more and more young people are joining in. · 150,000 Chinese students are studying in the UK right now. · 80,000 students from the UK will go to China for studies or internship by 2020. Young people are the main users of social networking spaces – and young people are the future of China-UK friendship. The Chinese Embassy will strive to provide virtual spaces that are lively and friendly. The focus will be to communicate on issues that are of interest to the everyday people. Here, people who care about China-UK relations and want to see it grow, can meet up, come to know each other better and share views and opinions. This is especially so for the young people. These social media platforms are a good way to strengthen the popular support for relations between our two countries. This is an ideal way to enhance mutual understanding and friendship between the people of China and the UK. Third, the Embassy social media platforms will offer virtual assistance to overseas Chinese that is only a click away. · It is a solid step to put people first. · It is a tangible measure to improve consular service. · It reflects a determined effort to cater to the needs of Chinese nationals in the UK. · It will bring consular services of the Chinese Embassy to the living room of every Chinese national in need. · And it will enable the Embassy to satisfy the diverse needs for information of Chinese nationals overseas. · This will provide much improved support for Chinese tourists and visitors. · It will greatly help Chinese nationals living, working or studying in the UK. So will it for Chinese descendents. · And the service will be convenient, prompt and considerate. It will make everyone who use it feel at home! In conclusion, I hope the Embassy social media platforms are off to a good start. And I hope they will grow strong and attract huge numbers of followers. At the same time, I also hope you will add us, forward our postings and share your comments. The outcome will be deeper friendship, greater understanding and stronger bilateral relations between China and UK!